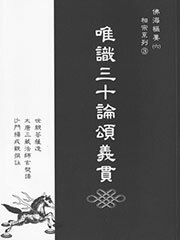 The Thirty Verses on Consciousness-only (Sanskrit: Triṃsikā; Chinese: 唯識三十論頌, Weishi Sanshi Lun Song) is a brief poetic treatise by the Indian Buddhist scholar Vasubandhu. It was composed in the 4th century CE and is one of the core texts of the Yogacara school. It was translated into Chinese by Xuanzang in 648 at Hongfu Monastery.